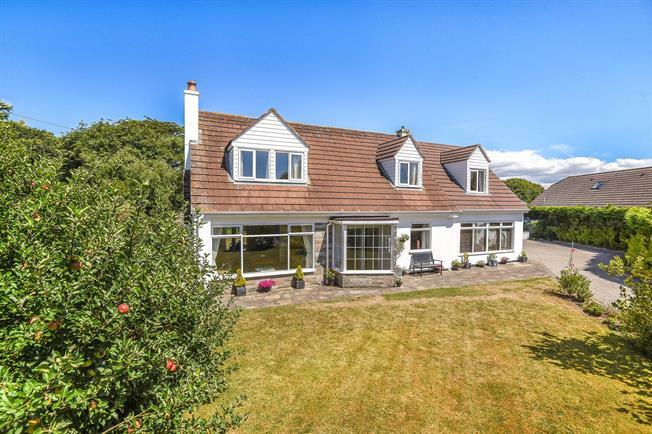 The Hollies is a beautifully presented four bedroom family home located in a secluded setting offering total privacy from neighbouring properties. The accommodation is extremely light and spacious and plenty of the accommodation gets flooded with plenty of natural light due to the large windows. The property is entered into via a covered entrance porch leading into the hallway which provides access to the majority of the ground floor rooms. The principle reception room provides extremely spacious living accommodation comprising of almost two rooms put together. There is a very pleasant view from the front overlooking the lawned gardens. To the rear of this room there are French doors leading to a sun terrace. The focal point in this room is a central fireplace with inset gas fire. Adjascent to this room is a formal dining room with opening to the sun room. From both of these rooms impressive views of the garden are enjoyed. The sun room in particular provides a comfortable place to retire after meals. The kitchen / breakfast room is located at the rear of the property and has a generous array of base and wall mounted cupboards complimented with spacious worksurfaces. Next to the kitchen is a separate utility room and rear porch. There is also a staircase which descends to the lower basement level. Completing the accommodation on the ground floor is a family bathroom. At first floor level there are 4 generous bedrooms with the master providing en suite shower room facilities. Completing the accommodation on this floor is a spacious family bathroom. The lower ground floor basement, created by our clients a few years ago, now provides wonderful additional space which the current clients have utilised to create a games room, gym and separate bar area. This wonderful space could be used for many other uses and offers wonderful flexibility. Externally the property is approached through a pillared entrance with the driveway leading to a parking area in front of the garage. The majority of the gardens are laid mainly to lawn and wrap around the entirity of the property and are extremely level. Within the gardens there is a summerhouse, greenhouse and a number of patio / sun terraces dotted around the garden. The property is located in a secluded semi rural position along with a small collection of property. A short distance from the property you will find the West Coast with footpaths that lead along the coast to other coves and beaches such as Perranuthnoe to the west and Praa Sands to the east. The nearby small village of Rosudgeon with convenience store and award winning Falmouth Packet Inn is within walking distance. A short drive away is Marazion and Porthlevern which have a popular selection of beaches, pubs and restaurants. A short drive from the property, the A394 can take you to either Helston or Penzance, both having a large variety of shops, schools, supermarkets and amenities. The following services are available mains electric, bottled gas for fire in the reception room, metered mains water, mains drainage and telephone line is connected (however we have not verified connection). Combination oil fired boiler providing both the hot water and central heating via radiators on both ground and first floor levels. From the A394 heading towards Helston from Penzance, take a left turn into Red Lane just before Rosudgeon. Stay on the lane until you find Grove Lane on your left where The Hollies will be the first property found on your right hand side.